The Guardian has an excellent story on burning of blanket bogs on grouse moors today. Well done to Guy Shrubsole who has done a better job than I managed in getting these details out of Defra. The papers released by Defra confirm what you will have heard in this blog: that Defra is under the cosh because the European Commission is pursuing infraction proceedings against the UK for non-compliance with the Habitats Directive in regard to protection of blanket bogs. The RSPB complaint which was taken in October 2012 (see Wuthering Moors 28, October 2012) is playing out as Defra attempts to persuade the Commission that it has everything under control (see Wuthering Moors 68). But it is my view (see Wuthering Moors 58, Wuthering Moors 68) that Defra and NE are trying to pull the wool over the eyes of the European Commission by getting land owners to agree a form of words that looks as though it rules out damaging burning of blanket bogs but in fact does nothing of the sort. 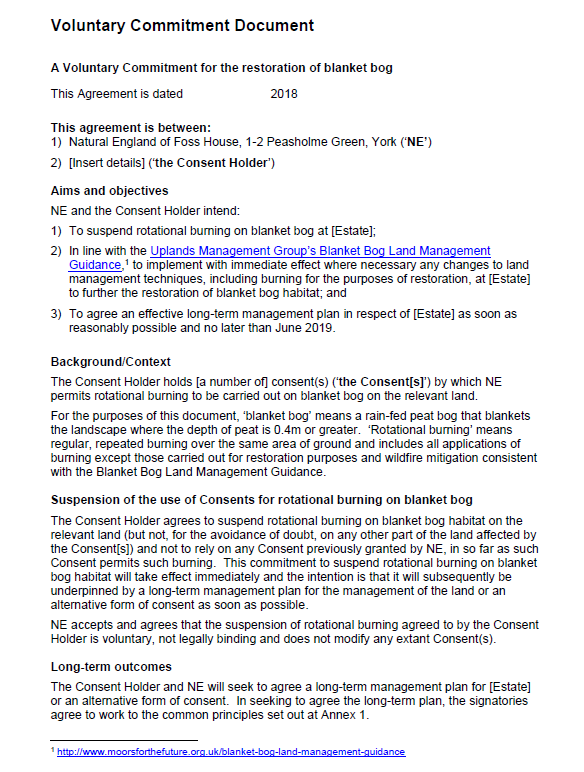 It was one of these agreements, for Walshaw Moor Estate, that I successfully challenged earlier this year (Wuthering Moors 67) and where NE had to admit that the agreement they had signed was unlawful. Here are the minutes of a Roundtable meeting of 1 February this year. It’s a metaphorical rogues’ gallery of moorland owners and note, for later, that the Moorland Association was represented. It was clearly an important meeting because the Michael Gove himself and Therese Coffey were both present, with an NE Board member and some very senior civil servants. These meetings don’t happen very often. I’m miffed I wasn’t invited – what fun it would have been! Michael Gove reminded those present, because it is only the taxpayer and the public who are kept in the dark about these things, that Defra was facing infraction proceedings from the EU because, for years, we (it wasn’t me, but it was my country) had been burning a protected habitat, blanket bog, in a damaging way which contravenes the Habitats Directive. 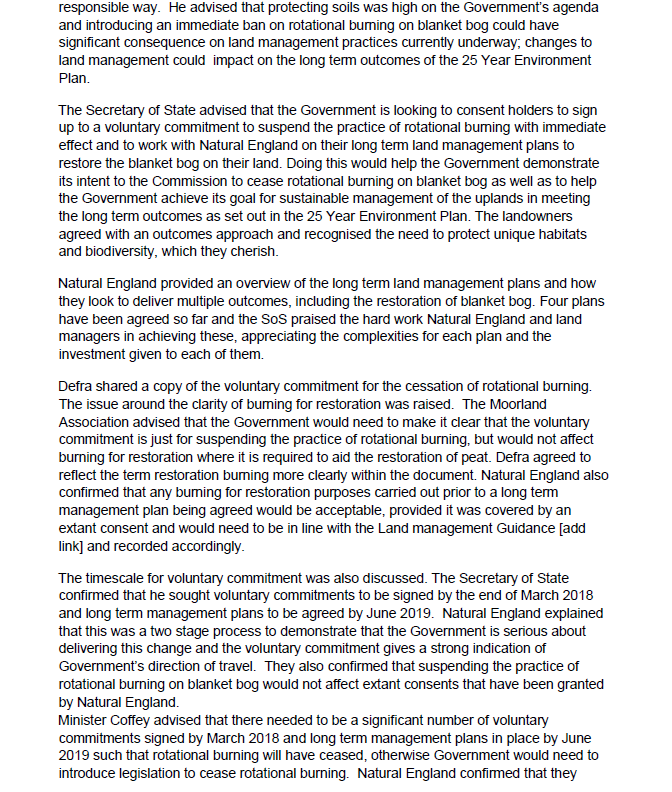 Defra wanted those gathered together in the room to go out and spread the word that it was important for all to sign up to voluntary agreements to cease rotational burning of this protected habitat. Then some wag from the Moorland Association said ‘What about, wink wink, you know, restoration burning if you know what I mean guv [or maybe Gove]?’ and was told that restoration burning was OK and that they could burn the land to blazes up until the time when they signed the voluntary agreement. 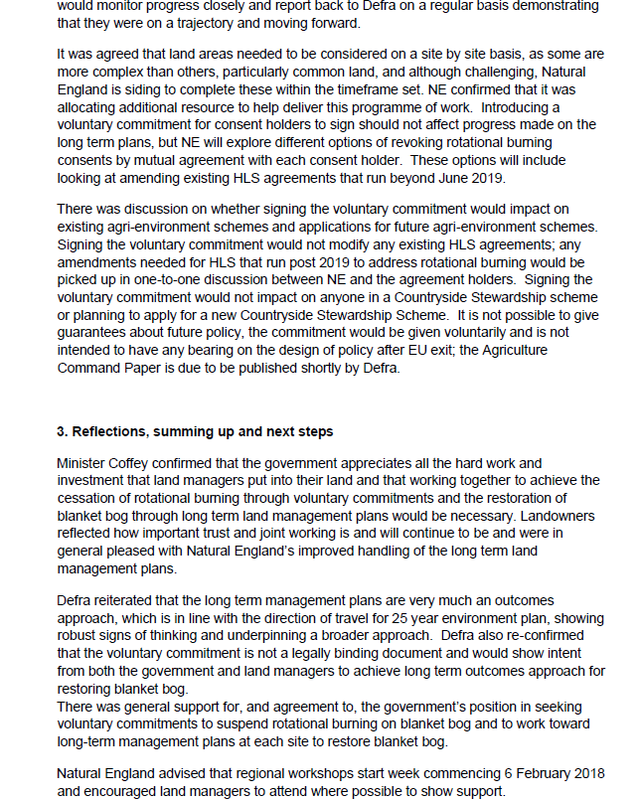 There is a strange phrase of ‘suspending the practice of rotational burning on blanket bog would not affect extant consents that have been granted by Natural England‘ which appears contradictory to me unless there is a word missing somewhere. So that was the meeting. It is Defra asking a bunch of mates to cooperate in the short term so that Defra can get the EU off its back. We know that one of these long term management plans to restore blanket bogs signed soon after this meeting was that for Walshaw Moor which was full of holes as far as controlling burning is concerned and consented, unlawfully, the building of a track across and through the blanket bog that these agreements were supposed to protect. This approach could work – but it looks like a scam to me. It is letting grouse moor managers off the hook because Defra is scared to admit that the existing consents have been allowing damaging burning for years (and we know that NE has allowed another damaging consent to run on for years too) and Defra is too scared or too much in bed with the grouse moor managers, or both, to clamp down on the environmentally damaging behaviours properly. Remember this has been dragging on for almost six years since RSPB complained to Europe and 18 months before that when the Walshaw Moor court case folded and years before that when NE was trying (as it was then) to get a grip of this damaging practice. It seems to me that this is a sorry indictment of the state of nature conservation in England these days. We have an industry, grouse shooting, which has been breaking the law (over wildlife protection) for decades and has been allowed to damage a high-priority habitat by the state nature cosnervation agency for years. When the UK was found out then Defra and NE came up with a plan which allows the damaging industry to carry on damaging the protected habitat in a fairly unconstrained way but they get together to construct a pretence of compliance. It is to be hoped that the EU Commission does not swallow this approach as being remotely adequate to achieve favourable conservation status of blanket bogs. Here is the initial document that landowners have been asked to sign. I expect they have signed in droves – after all it costs them nothing and constrains them very little. What do you think? Do you think that the strongly worded paragraph which starts ‘The Consent holder agrees to suspend rotational burning …‘ is rendered useless by the next short paragraph which says ‘NE accepts and agrees that the suspension of rotational burning agreed to by the Consent Holder is voluntary, not legally binding and does not modify any extant Consent(s).‘. Doublespeak in action (or actually Doublespeak inaction). PS Oh yes, and when I asked Defra whether Michael Gove had met various people in an FoI they said no. I’ll bet that Amanda Anderson was ‘the Moorland Association’ at this meeting and so I don’t think Defra told me the truth – but if I’m wrong then they will let me know because I’ve asked them. And it couldn’t possibly have been here, could it, that the reported remark from Michael Gove to grouse moor owners about protecting their vulnerable flank was made? Or could it? Well its CARRY ON REGARDLESS. If that was agreed in feb 2018 then it never worked this spring, unless it was restoration burning? All very chummy. Can we expect a meeting between the Secretary of State, the Under Secretary of State and the high command of NE and representatives of some of the other stakeholders in moorland management - RSPB, BAWC, residents of Calderdale, Ban the Burn etc? Julia Aglionby is the wife of Charles Weir, owner of Geltsdale estate. She works for a land agent and is head of the commoners in Cumbria but has never worked a Red Grouse moor. So I presume she would be signing for the commoners who are the ones who just let the whole area burn rather than working little patches! A great note from the hot summer is that where peat bogs have been damned and water held back in the peat rivers like the Gelt have kept their water running through the summer even with extraction by United Utilities who paid not one penny for this work! Amazingly Charles Weir is paid by UU for this same water with the local community getting nothing. So much for commoners!! I don't think the phrase you highlight is contradictory - it just reaffirms the point that landowners are agreeing to the changes purely on a voluntary basis. All the legal consents will remain in place, unmodified. It's essentially a way of parking the issue until the threat of EU action is no longer there. Defra are asking them not to burn in the same way as they are asking them not to kill Hen Harriers - but without the legal back-up. I think we all know what will happen. 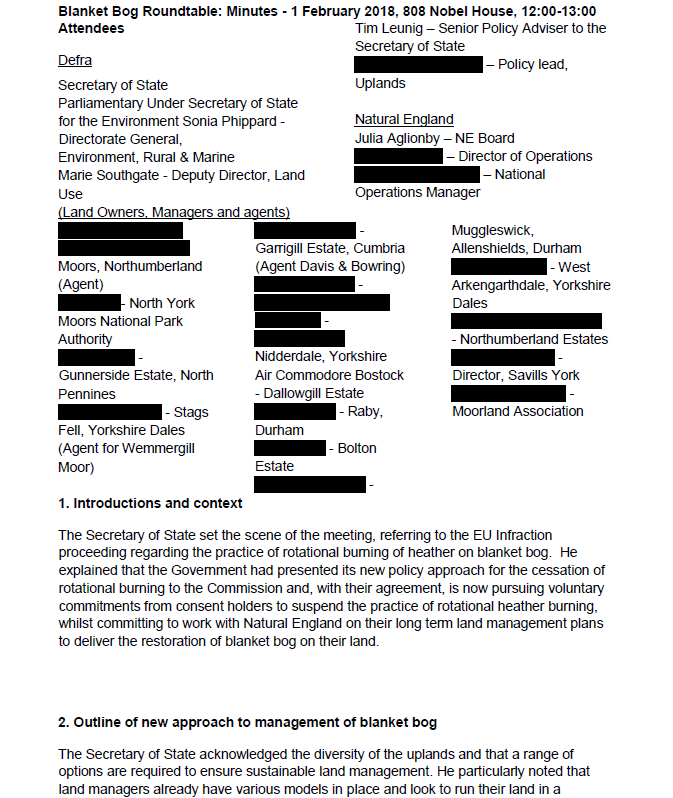 That black redaction block for the Moorland Association contact would be rather a neat fit for 'Amanda Anderson' - to the nearest millimetre I would suggest. As you say, a ‘rogues gallery’. Perhaps ‘a perfidious nest of vipers’ is also an appropriate description. I was sat next to Amanda and companion at the NERF Hen Harrier Awareness Day held at grassington on Saturday 11th August for the first session. After the break I realised she seemed to be no longer in the Hall. That was a pity really because she missed the showing of the Video of the Bleasedale, in Bowland, Peregrine killings, in 2016. What a Shame! The thing that gets me is the sheer bias, where Defra ministers are only too keen to meet with and accommodate vested interests, the Moorland Association, grouse moor owners etc, etc, and yet go to great lengths to avoid any meaningful discussions and meetings with actual conservationist. I know I might sound a bit repetitive with the institutional corruption thing, but what else can I say in the face of such obvious bias? When I say institutional corruption I don't necessarily mean the exchange of brown envelopes. I mean where ministers go out of their way to accommodate those they see as allies, and deliberately snub the far more professional, informed, and neutral conservationists acting in the public interest, whilst turning a massive blind eye to environmentally damaging activity, which can put the public at risk, and the illegal persecution of raptors, self-evidently by sectors of these vested interests. Ministers don't hold public office to accommodate their friends and allies when it's not in the public interest. Mark, I can't substantiate this, because I can't re-find it, but recently, in the last few days I saw on television that a charity was providing a motor scooter and training so that a youngster in Swaledale could get to work, because there are no buses. great scheme fully support it. The problem he is an apprentice gamekeeper on the Gunnerside Estate. If they can't or aren't prepared to help their employees then why should a charity help them out. Gunnerside got £100,000 in CAP payments 2016.